This Website Is No Longer Active. : Further evidence that Linda's daughter was illegally kidnapped and removed from America. Further evidence that Linda's daughter was illegally kidnapped and removed from America.
" The Department of Children and Families has obtained the pick up order from the United Kingdom. We are requesting that a pick up order be issued for N*****a Lewis in our jurisdiction." who illegally signed The " Verified Petition" and the "Sheltered Accommodation Documents " that was presented to the Department of Children and Family's in Orlando. Based on Miss Fiorino's statement in her sworn affidavit the " UK pick up order and the same that was to be issued in her jurisdiction " should be available for proper scrutiny if they ever existed. 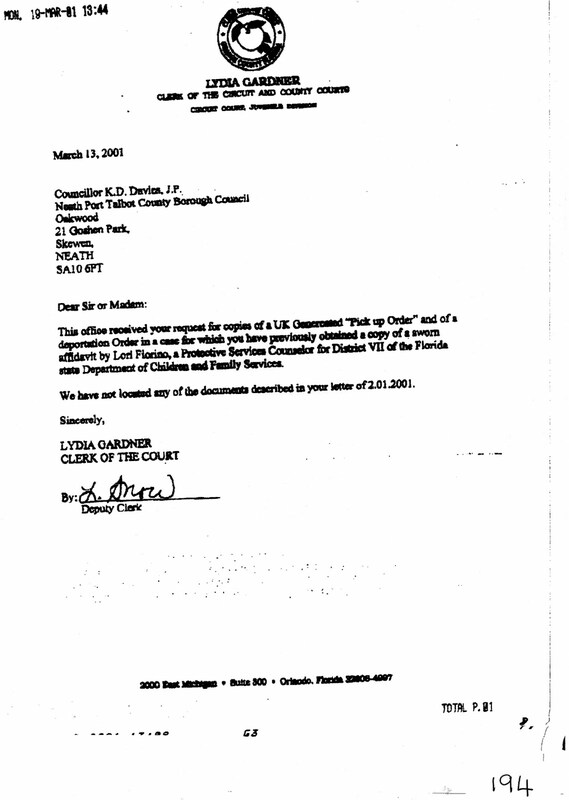 Well not according to Lydia Gardner, Clerk of the Circuit and County Courts in Orlando Florida. This is her reply to a request to view these " pick up orders" from Councillor Keith Davies of Neath Port Talbot County Borough Council. 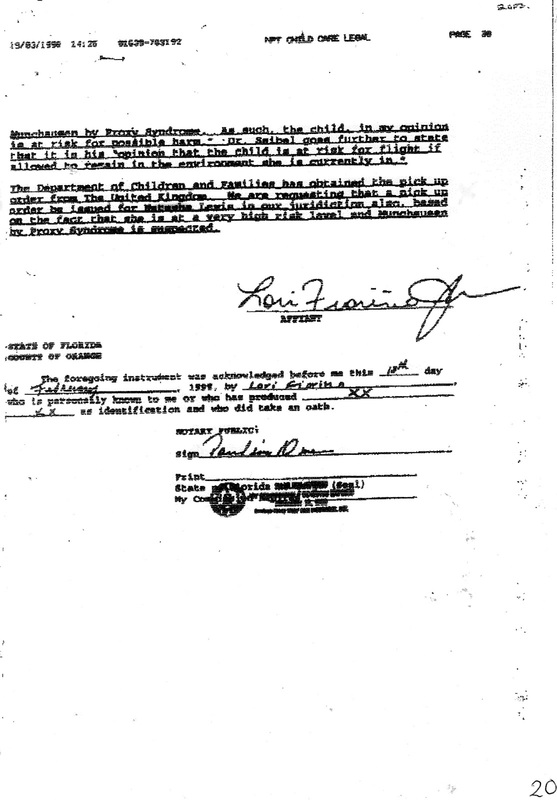 "We have not located any of the documents described in your letter of 2.01.2001." Further conclusive proof that there never were any "pick up orders" of any kind ever issued in either the UK or in Florida and that this is quite simply a case of "Child Kidnapping by the State " carried out by Social Services to cover up for medical negligence in the UK. Nothing about this case has ever been legal. Those in power are corrupt and despicable. This cannot be allowed to cintinue any longer. The guilty should hold up their hands and admit their shame. All the people involved should be Jailed. We have received the disc regarding the tragedy that the UK authorities have inflicted on the Lewis family. I am embarrassed of the part that my country has played in what happened to this child. It breaks my heart and I am so sorry. I will do everything that I can to right this terrible wrong. You have my word.